Accel Pro Sleeve is perfect for protecting your spark plug wires against intense heat and abrasion. The sleeving will fit over all spark plug wires and is available in two different versions. Installation is simple, after removing the spark plug boot simply slide the sleeve as far down the plug wire as desired then trim to fit. The base version (silver) is a fiberglass braided sleeve that can withstand temperatures of up to 1,200 degrees. 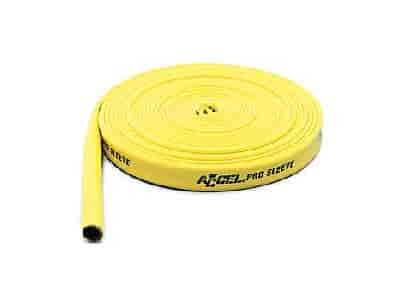 The high temperature (yellow) sleeving is the same as the base sleeving except it has also been impregnated with bright yellow silicone for improved heat resistance and extra voltage insulation. The high temperature sleeving can withstand temperature of up to 2,000 degrees. 170071 is rated 4.0 out of 5 by 1. Rated 4 out of 5 by Jaabo from Worked for me Wished it was larger in diameter would not cover all the way to the top of spark plug. But does protect the plug wires, but not the boots.